Wendy and I have been working most weekends since Spring Break on preparing for her move into Meador Manor with our marriage in July. So we passed on many weekends of good hiking weather, and I haven’t had time to blog about our hikes on Spring Break. Now that the city cleanup days are over and the Manor is almost ready, I can start catching up on my pending posts. Wendy and I spent several days of our 2016 Spring Break at Sugar Ridge Resort on Beaver Lake in northwest Arkansas. We had previously stayed in the same cabin in June 2014 and March 2015. Previously we have hiked the short trail on the old railroad grade at Beaver town nine road miles northeast of our cabin and the Bench Rock Nature Trail four road miles southwest of our cabin. We again wanted to hike on this visit, and I selected a couple of nearby destinations that were unfamiliar to both of us. 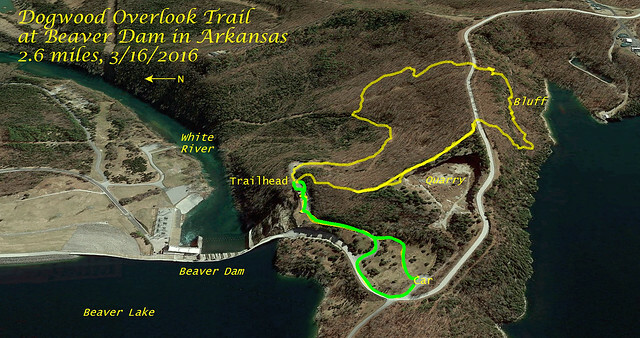 The first was only a couple of miles southeast of our cabin: the Dogwood Overlook Trail at Beaver Dam Site Park. I had read online that the trail was two miles over steep terrain, although I wasn’t sure if that was an out-and-back distance, a loop, or one-way. I could not find an online trail map, although I read that local Boy Scouts had created a new hiking trail map available at the Corps of Engineers office in Rogers. Ideally every hiking trail would have a map online in PDF format along with GPX and KMZ GPS files. But that is easier said than done; I have not been posting my own maps in those formats either, instead only creating trail track views in Google Earth from KMZ files exported from my iPhone’s MotionX GPS app, which I edit in Corel Presentations and upload in the photo albums for my blog posts. I’ve created over 150 of those suckers thus far. Starting with this hike, I’m adding links to my Trail Track images and GPX and KMZ files to my Day Hikes spreadsheet. Eventually I would like to find the time to add similar links for previous hikes. We took our time getting started, enjoying watching Downy and Red Bellied woodpeckers at our cabin feeder. Eventually we were ready to head out, and drove the couple of miles over to Beaver Dam. The trail entrance was in the overlook area, which was not yet open to vehicle traffic. So we parked uphill at a recreational vehicle dump station and trekked cross country to the overlook. 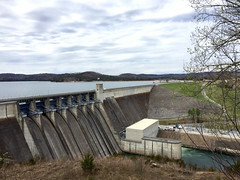 As we gazed down at the spillway, the siren sounded, indicating the hydroelectric generator was starting up and there would be increased flow downstream into Table Rock Lake. We located a flight of stairs at the trailhead, where a sign told us the Boy Scouts did more than map this trail: Troop 136 in Bentonville, Arkansas built it. Later I read online that its construction was an Eagle Scout Service Project. Bentonville is 30 road miles southwest of the dam. The stairs initiated the first of what would end up being five steep ascents on our journey. I logged the elevation changes, showing that we ascended 50 feet for a higher view of the dam spillway, following helpful tree badges. We spotted the trail’s eponymous dogwoods as we climbed the hillside to reach the edge of the large quarry. Highway 187 snakes around it on the south side of the dam. Wendy had me pose for a photo. There was one finished block embedded in the ground at the base of the quarry, and Beaver Lake was visible above the edges of the quarry as we gazed westward along the quarry’s old road. It turned out that the dump station we had parked at was at the end of that old quarry road. 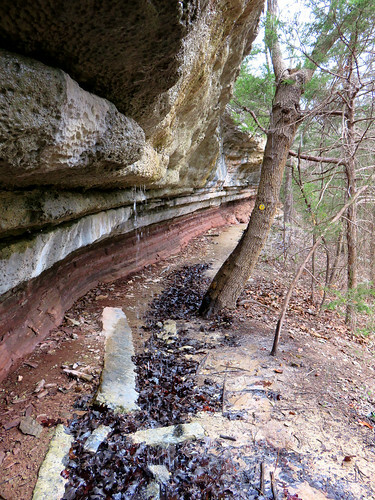 The trail led up along the ridge on the east side of the quarry, with the land sloping off to the east and abruptly ending in the quarry’s edge to the west. We ended up climbing 100 feet to reach highway 187, where the trail faded out after reaching a gate. Lacking a map, I thought we might have missed a turn. So we backtracked down to the quarry, finding no side trails. So we trooped back up the hillside to the highway and crossed it, happily discovering a trail badge and arrow on a tree on the far south side. They need to put up signage on the north side of the highway to help newbies to this trail. On the other side of the road, the trail made a steep 200 foot descent to reach its closest approach to the shores of Beaver Lake. The lake earns its name; we saw clear signs that beavers had downed and chewed a tree near the trail. 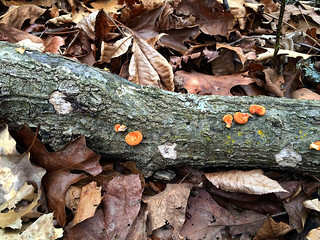 We got a nice view of the lake below along with some tiny fan fungi which were growing on a log. The trail turned and made a steep 90 foot climb to a bluff line, where some handy wood steps were built to allow us to ascend to walk alongside the bluff. Wendy posed for me, and we enjoyed passing by a small waterfall. I shot some video of it. The trail has a number of benches, for which we were grateful given its propensity for steep climbs and dives. Along the 150 foot ascent from the bluff back up to highway 187, I relaxed on a bench, snapping a photo of a nearby dogwood bloom. Meanwhile, Wendy the rock hound scoured the area for geological finds. She laughed when she found a rock that had been slathered with some of the green paint from the bench. A branch farther along the trail had been slathered too, but its paint was lichen. We reached the highway, where this time there was a nice large “Hiking Trail” sign on each side of the road, making it easy to spot this crossing. The trail descended 230 feet on the opposite side of the ridge road, winding its way through the forest. 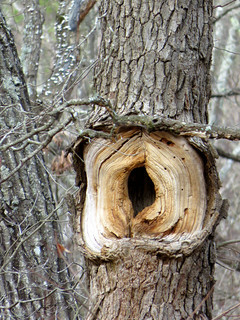 We spotted a distinctive tree hole, and I liked the Dogwood blooms sprinkled across the forestscape. We reached an old dirt road, which led back to the overlook area, with a gate marking the end of the trail loop. As we returned to the car, we could see the Sugar Ridge Resort perched across the lake. I used my superzoom camera to show our cabin to the right of the large unfinished Moon Stone Farm building atop the ridge. We enjoyed our hike, which gave us a good workout with its constant steep elevation changes. The steep hillsides made it seem longer than two miles, and admittedly our backtracking to the quarry stretched the hike to 2.6 miles. We also were both getting over colds, so we had hacked and coughed throughout our trek, blowing our noses regularly. We weren’t hiked out yet; the next day we would have another great hike at Lake Leatherwood. More on that in the next post. This entry was posted in day hike, photos, travel, video. Bookmark the permalink.